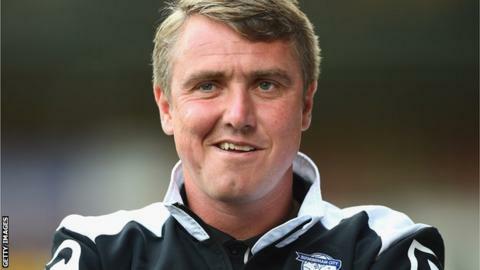 Blackpool manager Lee Clark says he is ready for the challenge of keeping the Seasiders in the Championship. The 42-year-old replaced Jose Riga on Thursday on a one-year rolling deal and takes over a side lying bottom of the table, seven points from safety. Clark, who began his managerial career at Huddersfield, led Birmingham City to Championship survival on the final day of last season. "It's a huge challenge without a doubt," he told BBC Radio Lancashire. "I wouldn't be here if I didn't think I could do it. "If someone says to me the only reason we'll stay in the division is if I've got to run the full length of the stadium and throw myself into those orange seats, with the fans, not a problem." "Nobody wants a relegation on their CV. I've been lucky enough in my career never to have that as a player, coach or a manager. "I believe we can do it. It's been reinforced when I've worked with the players and seen the quality of the group." The former Newcastle, Sunderland and Fulham midfielder, who was recently sacked by Birmingham, will hope to have a better relationship with Blackpool chairman Karl Oyston than his predecessor Riga. Oyston and Riga, 57, regularly appeared to clash during his four months in charge of the Seasiders, particularly over transfer policy. Asked if he had been assured he had funds to bring people in, Clark said: "Yes. - in the loan market and, if possible, in January. "January is a tough market to work in anyway because it's inflated prices. Most of the business done is from the bigger clubs who can afford to pay that little bit extra. "If there are players available, I've spoken to the chairman, then there's possibility of a few coming in to strengthen the squad." Last season at his former club Birmingham, a 93rd-minute equaliser at Bolton saw Blues escape relegation to League One on the final day. "If someone says to me the only reason we'll stay in the division is if I've got to run the full length of the stadium and throw myself into those orange seats, with the fans, not a problem," joked Clark. "I hope we've got it done and dusted before then."